OS grid reference: NY 0720 0360. At the north side of Gosforth village on Wasdale Road, Cumbria, stands the ancient parish church of St Mary and, in the churchyard the equally ancient and famous Gosforth Cross. The monument is a very tall, slender Anglo-Norse (Scandi-navian) high-cross made from red sandstone, dating from the 10th century. It is richly decorated with some very exquisite carvings of Norse gods, Christian symbolism and mythical beasts. The ancient church houses two hog-back tombstones and another carved stone. Whitehaven on the Cumbrian coast is 12 miles to the north-west and the A595 is three-quarters of a mile to the west of Gosforth village. Seascale the attractive holiday town is 2 miles to the south on the B5344. The Gosforth Cross stands at 4.4 metres (14 feet 5 inches) high and is very well-preserved for its age, which is probably 950-1000 AD, the late Anglo-Saxon age. It’s slender shaft tapers away towards the ornate, four-holed cross-head that is also in a relatively good state of preservation. Three-quarters of the cross-shaft N, W, E and S faces are richly ornamented with scenes (in panels) bordered by roll-moulding showing Norse gods like Thor, Odin, Loki, Mimir and Heimdallr, all of whom figure strongly in the famous Norse poems of Edda, but there are also Christian figures too like Christ crucified and symbolism from the early Christian period. Thor is depicted fishing for the Midgard serpent Jormungandr, Heimdallr is holding his customary horn, Loki appears chained and bound with his protective wife, Sigya below him, and Vioarr is attempting to open the fearsome jaws of Fenrir. Christ appears crucified and also in majesty, a sign of his victory over the pagan gods. There are many strange mythical beasts’ heads that are joined together with interlacing, including a dragon (Surt) and numerous serpents, and also animals such as wolves and deer. A number of human figures also appear, one is holding a spear, while another has his arms and legs chained with a knot-work cord around his neck in the form of a snake; also a female figure holding a bowl. Horsemen are also quite prevelent with spears. 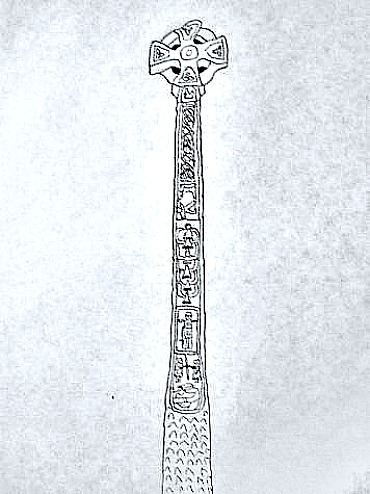 The lower rounded section of the shaft has much plainer chevron-style pattern-work representing the tree of Yggdrasil, while below that the bottom of the shaft is largerly devoid of carving. The significance and symbolism of the carvings were first identified by Mr Charles Parker, the antiquarian, in 1886, who later wrote about his findings in a book. Inside the church of St Mary, a Norman foundation on a Saxon site, there are two carved hog-back tombs (shaped like houses) from the Viking Age, one of which shows Thor once again fishing for the Midgard Serpent, as well as battle scenes and other carvings. Another Anglo-Norse stone in the north aisle called the Fishing Stone, may be part of a cross-shaft or part of a Anglo-Norse frieze? This depicts a deer trampling on the fearsome serpent Jormungandr and dates from the 10th century AD. Parker, Charles., Ancient Cross of Gosforth in Cumberland, Elliot Stock, 1896. Bord, Janet & Colin., Ancient Mysteries of Britain, Diamond Books (Harper Collins), 1991. Maxwell, Fraser., Companion Into Lakeland, Methuen, London, 1939. 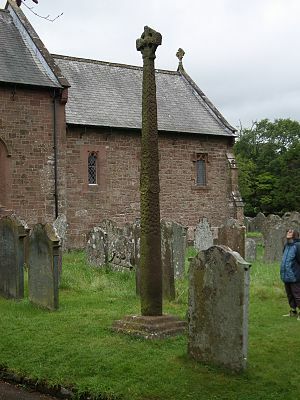 Categories: Ancient Churches / Chapels, Ancient Crosses, The Gosforth Cross in Cumbria | Tags: Ancient Crosses, The Gosforth Cross in Cumbria | Permalink.